Bangalore Pre Launch Properties: The Peninsula Heights Amenities – A Class Apart! A real estate project is always judged on the basis of some indispensible factors and amenities are certainly one of those. Peninsula Heights by the reputed builder Peninsula Land Ltd. has all of the enviable and world-class amenities. The peninsula heights apartments are of 3 BHK, 4 BHK and 5 BHK facilities. The project comes with 2-level car parking and separate space for guest cars. There are amenities galore such as swimming pools for kids and adults, senior citizen corner etc. Peninsula Heights is a stone's throw from important hubs of the city, schools, hospitals, shopping malls and movie theatres. Public transport connects JP Nagar with all parts of the city. Peninsula heights jp nagar is ready to set a benchmark with all its amenities and specifications. The Project has got 2 towers namely Crown Tower and Ascent Tower. · This is the hub of contemporary lifestyle amenities and breathtaking landscape views where a newer generation family will experience thrill and indulgence. 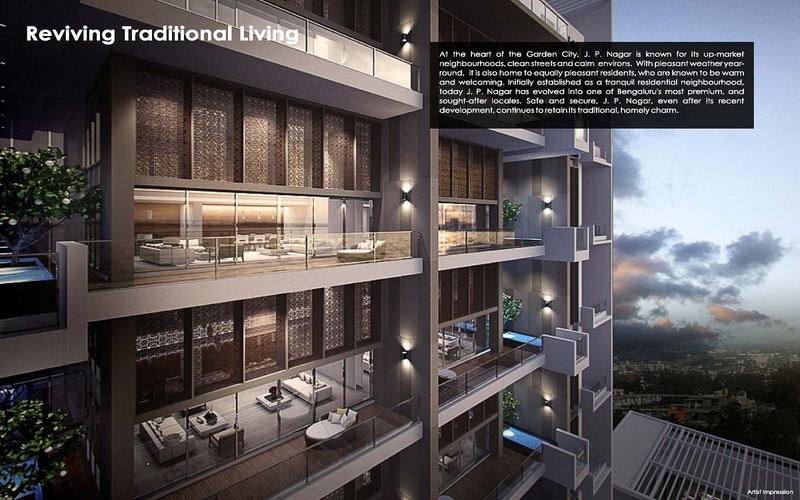 · The Ascent tower of this project comprises 16 floors with 3 and 4 bedroom apartments with private lift lobby area while the Crown Tower consists of 20 floors and has got all the 3 types of homes including 5 BHK Duplex and Penthouse. · Rain water harvesting, Solar lighting, Children play area, Barbeque area, Senior citizen corner, Children’s pool, State of the art gymnasium, Table Tennis, Squash court, Board games, Billiards room, Aerobics and yoga room, Mini theatre, Indoor golf simulator, Multipurpose hall, Business centre, Library and reading room, long stretch of jogging track etc. are managed to be equipped within the same premise and all of them are indeed enviable. · Club House, Community Hall and Departmental Store are also been placed within the premise. · Imported marble flooring and skirting has been provided in living, dining, master bedroom, Puja room and passage. Premium wooden laminated flooring and skirting have been used in family room and one bedroom. · Vitrified tiles flooring and skirting in other bedrooms are the main attractions of bedrooms. · Coloured video phone with intercom and camera are adjusted outside the main door. · Acrylic emulsion paint has been used throughout. Exterior grade emulsion for utility and deck and balcony areas ensures quality materials. · Cornice for the entire apartment has been provided. Clear 10 feet floor to ceiling height in apartments and Partial power back-up within the apartments have also been equipped. · The project is well equipped with all modern amenities and 24 x 7 security service to facilitate the needs of the residents which actually ensure the safety of the inhabitants. More than just having the best of amenities and specifications, Peninsula Heights can certainly boast of a very innovative and brilliant appearance of the project. The property is spread across 3.64 acres of land with large portion of land allocated for greenery and landscaping. The area of the 3 bedroom apartments ranges between 3240 sq. ft. to 3860 sq. ft. There are landscape and fountain adjusted in the lawn that helps in the embellishment of this magnanimous project. Thanks for sharing great post. I really like this post. I too have something worth sharing about Rohan Upavan New Projects at Hennur Road location of Bangalore.